Half a 500-gram piece of an exquisite sausage made with a whole pork loin, without external fat, marinated with a dressing prepared with paprika, garlic, oregano and olive oil. The loin is a stuffed piece, which means that it has been cured inside the natural pork gut, like a whole piece, without chopping. 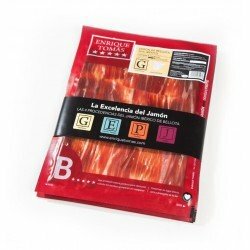 Lomo Ibérico de Bellota is a unique product of Spanish gastronomy and is obtained from Iberian pigs fed freely on acorns and wild herbs during the Montanera. 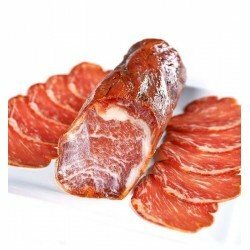 The characteristics of this particular animal, together with its careful feeding, give rise to culinary delicacies such as this fantastic lomo, a high quality sausage with a flavour full of nuances.